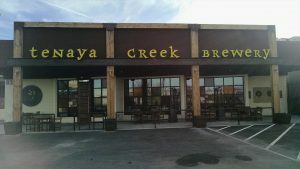 In 1999, Tenaya Creek opened as a restaurant and brewery. In 2008 they decided to focus solely on the brewing side of the business. An expansion in 2010 would introduce Las Vegas to a 22oz bottling line. Outgrowing the original location, in November 2015, they relocated to a new building that allowed them to triple their output from the get go and started a canning line. Their beers can be found not only in Nevada, but also Arizona, California, Utah and even Canada. We had their beer flight, which comes with your choice of 5 brews. My favorite is the Old Jackalope Barleywine. You can always see what they have on tap at anytime by checking out their live web cam. 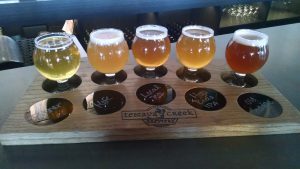 The beers from Tenaya Creek can be found all around the valley, but nothing like stopping by their taproom to get the freshest beer that they can offer. Make sure to get some of their cans, bottles and growlers that they offer to go.